Some 780,000 striped bass and 480,000 hybrid bass–a total of about 1.2 million fish–were stocked in Lake Hartwell during the past three weeks by the S.C. Department of Natural Resources. 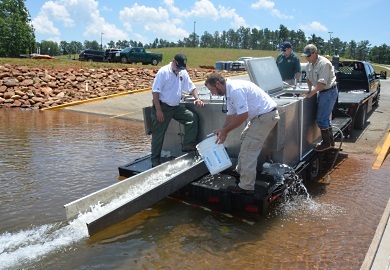 Some 20,000 striped bass fingerlings were placed into Lake Hartwell June 3 at Green Pond Landing and Event Center in Anderson County as part of an overall S.C. Department of Natural Resources (DNR) stocking program that annually produces between nine and 12 million fish that are released into public waterways. The striped bass fingerlings stocked into Lake Hartwell are around 1.5 to 2 inches long, and they can be expected to reach a catchable size in two to three years. The fish were produced at the Dennis Wildlife Center Fish Hatchery in Bonneau. All of the striped bass stocked in Hartwell are the Savannah River Strain, which is a genetically distinct strain that originated in the Savannah River drainage. The DNR hatchery program includes five warmwater hatcheries around the state, and a coldwater trout hatchery located near Walhalla in the Upstate. In addition to striped and hybrid bass, the DNR’s hatchery program produces rainbow, brook, and brown trout; largemouth, white and smallmouth bass; bluegill, redear (shellcrackers) and redbreast sunfish; crappie; channel and blue catfish; and robust redhorse. Hatchery-reared fish are stocked in the state’s rivers, major impoundments and smaller DNR-managed fishing lakes. The goal is to provide South Carolina’s citizens and visitors with the best recreational fishing opportunity possible while protecting and conserving our aquatic resources. Recreational fishing is a multi-million dollar economic driver for South Carolina. Anglers spend more than $680 million in the Palmetto State annually, according to a national survey conducted by the U.S. Fish and Wildlife Service and the U.S. Census Bureau. That’s part of an estimated $2 billion total, spent on wildlife-related recreation in South Carolina each year.